Hi bloggers! Its me, here with another creation for this months color challenge over at Stylin' Stampin' INKspiration, head on over and check out the details and join in the fun!! Most would think Halloween when you see those colors, but I came across this cool technique called "Joseph's Coat" and wanted to try it with these colors. I also knew I wanted to use the Swallowtail Stamp! Head on over to Frenchiestamps to watch her video. Its a great way to do a different kind of stamp emboss resist technique. So this is what I came up with. Not perfect by no means, but this was my first try. I had a lot of fun with my creation, leave me a comment and I can't wait to see your take on these colors!! I even added half of the butterfly to the inside for an added touch. SO VERY CUTE! 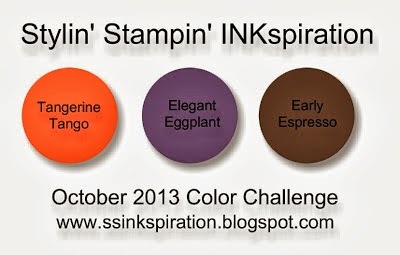 Thanks for taking the time to create with us at SSINKspiration! This is beautiful, Cynthia!! What a fun technique and a beautiful stamp to use!! So glad you came across this color combo and played along! What a fun technique! This is a really pretty card! Thanks for playing along with us at SSInk! I love how you did the coloring on the butterfly Cynthia, beautiful! Thanks for playing along. Love it!!! Thanks for playing along with us at SSI!! !